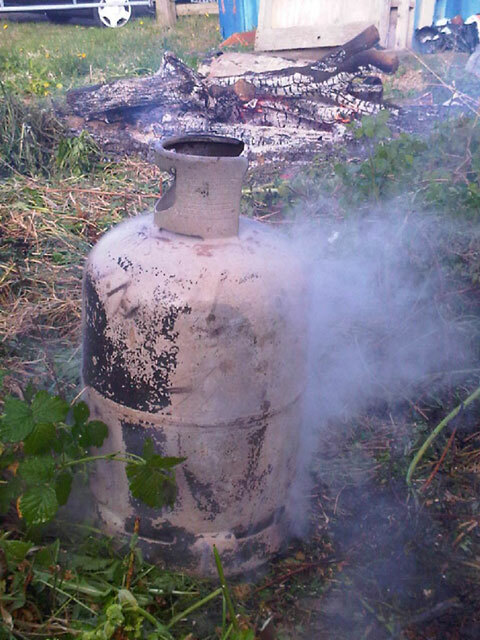 Inspired in part by the Ozpig and a rekindling of unfulfilled plans I decided to have a go at reusing old gas cylinders. 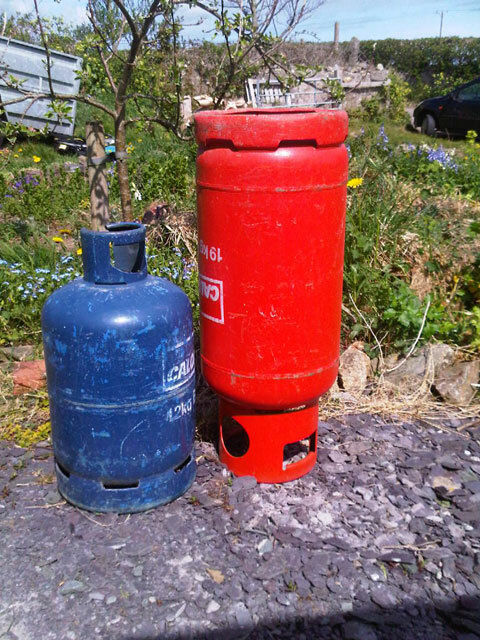 Our local coal merchant answered a call on Freecycle and I picked up a couple of 15kg butane cylinder and a 19kg propane cylinder both of which were no longer serviceable and I was told they can't be recycled as scrap. My first problem was how to ensure the cylinders are empty of gas. I couldn't get the brass valves off so I took a risk and drilled two holes in the base of the cylinder, running water over the drill bit to reduce the possibility of sparking. This isn't the safest way of doing this and I should have least used a hand drill brace rather than a power drill at the very least. A hose pipe was held firmly over one of the holes and the remaining gas in the cylinder was displaced by the water. I drained the cylinder and repeated the exercise twice more. One could argue the next stage was probably a little more risky than drilling holes but I wasn't overly sure that when I started to cut through the cylinders with a plasma cutter that there wasn't any remaining gas. 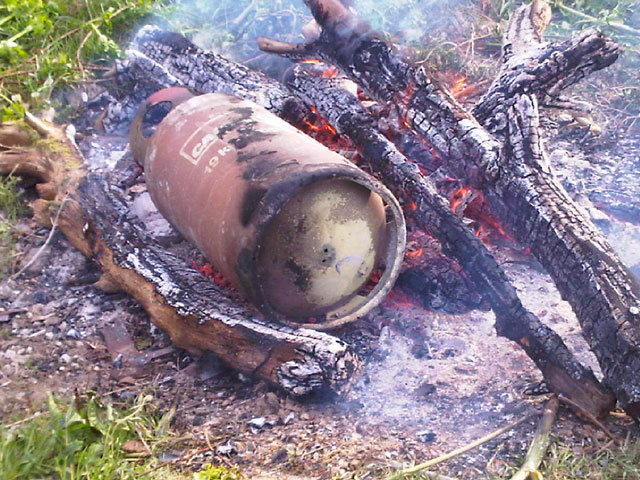 I needed to burn off the paint and so took the plunge and roasted the cylinders in a open fire, well clear of anything likely to get damaged in the small likelihood of an exploding metal tank. The first thing I wanted to make was a simple forge. 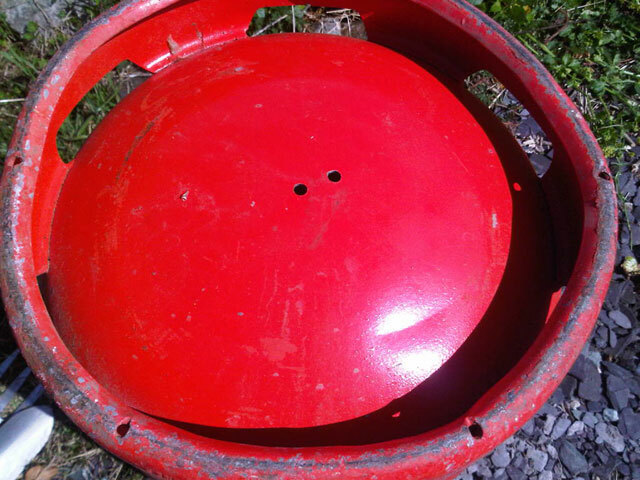 I decided the top of the 19kg propane cylinder was ideal so cut that off. I'll make the tuyere and fire grate later, for now here's what it looks like. I need to find a way of making neat cuts the free hand method is a little rough. 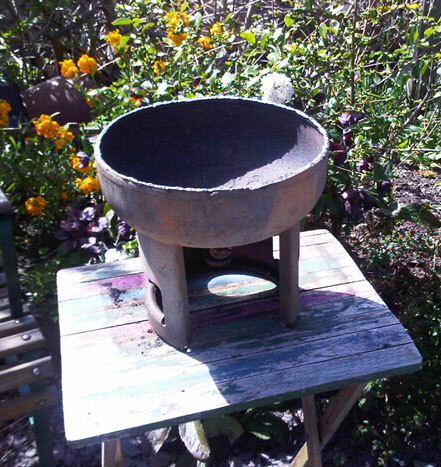 I a bit of wire brushing or sand blasting would clean the surface nicely and perhaps a bit of fire black as used for stove, would make it look really nice. 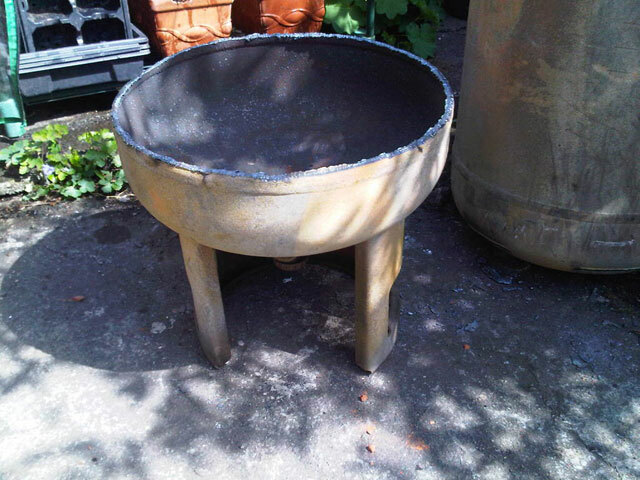 I need to practice my TIG welding next and then I'll have a crack at making an Ozpig style of outside wood burner. Wrap some thing round the cylinder so the plasma cutter can rest / follow it to neaten the cut. It does not matter what it is as the torch will be long gone before it gets burnt. Do the same for straight lines on flat plate too. Bits of wood are fine. I thought about making cradle with small wheel and a stationary guide to cut off ends but that's only practical if doing production runs. I'll try the bits of wood approach next. Yes, they're great should have got one ages ago. The one I've got has a built in compressor which is useful. We never managed to get the valve out of an orange one but have with the blue ones and have one awaiting conversion to something usefull. 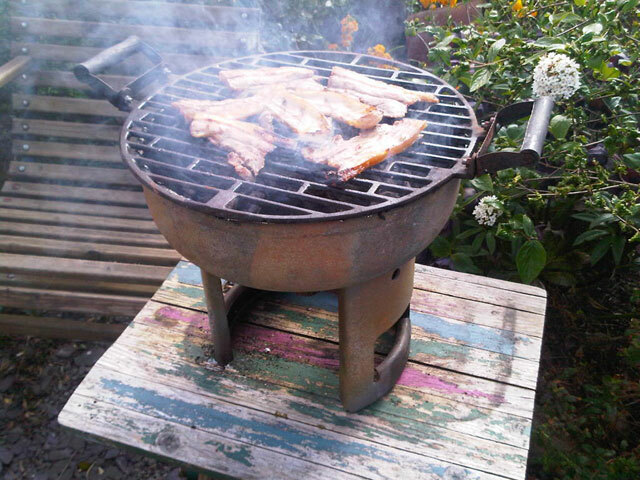 We made a handy simple wood burning outdoor heater which also cooks food nicely on an old grill rack when the bottom fills up with nice hot glowing embers. Like your use of the top as a barbie and will probably do the same but we have to chain drill and the finish off with a grinder because we dont have gas cutting kit. I doubt I would have attempted it without either a gas torch or plasma cutter. I opted for the plasma as I couldn't justify the cost of gas cylinder rental charges and I don't like the concept of disposable gas cylinders. If you have pictures of what you've done that would be great. I did think about using a rifle. Drilling holes isn't as mad as it seems. An explosion can only occur if there is sufficient oxygen in the mix so it's safer to have a little gas pressure in the cylinder. Any spark will ignite the gas outside the cylinder but not inside at least for a while anyway. The valve needs a good stiltson wrench & about a 6 foot bar to undo it (and a way of holding the cylinder still). If you are worried fill with water & drain. Dont worry about the smell its from the added stuff to give the gas its smell. It clings to the cylinder even when empty. One with a compressor would be good. I have to either run them both on the genny or whilst the compressor is on not cut or the load would be to high for the inverter. Veg plot I struggle a lot with computers and would have to get a friend to sort it out so all I can do is describe. Basically we beheaded the cylinder just before it started to get to maximum width and then drilled some holes for bottom air and some holes and slots for top air.It was all a bit experimental but it is not any use as an incinerator. To use I put some thich chunks of wood in the bottom an d then light a fire on top of them and slowly feed it with timber offcuts.It gets good and hot and the lumps in the bottom become a good hot ash bed.Now it is ready to grill. Add more wood after the first lot of food is done and you can cook again when the smoke stage is passed. It has to be tipped out to empty the ash ,its a bit crude and experimental.We made one for somebody else and they didnt like it because it was no good for dramatic roaring fires and burning plastic !,so thats reminded me to go collect it and maybe make a few mods.